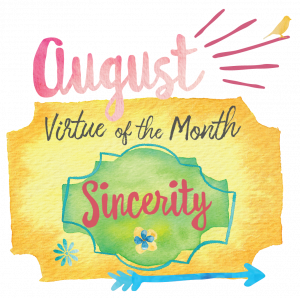 The virtue of the month for Challenge and Conquest in August is sincerity. Sincerity is to live and speak the truth. God wants us to be sincere and truthful with people. You can’t choose who you are sincere with and who you are not. That is duplicity. Happiness is a consequence of being an honest and sincere person. When we lead double lives or don’t practice what we preach, it creates a kind of division in our heart that makes us unhappy. The 8th commandment tells us how important sincerity is to God. Being sincere does not mean saying everything that is on your mind. You need to be mature enough to know how to differentiate between truth and your opinions. Many times we are sharing our opinions and not an objective truth. Objective truth is something that would be true no matter who says it (or something that is true outside the subject). Subjective truth is something that is or seems true to one person (one subject). For example, telling your friend that you think their shirt is ugly, is not being sincere, even if you think their shirt is ugly… that is just being a bit mean and sharing your opinion. Try to reflect before speaking to determine whether your words will build up or tear down another person. Slander or gossiping is a form of insincerity because many times we spread rumors that may not be true. A sincere person is honest and true in all she or he does and says. 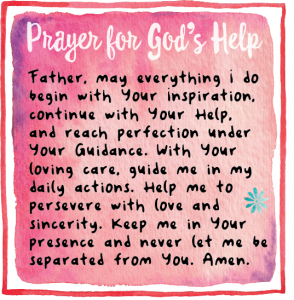 Sincerity can be hard and that is why the Challenge holy card this month has a Prayer for God’s help. In the Gospel of Matthew, Jesus says ” Let your ‘Yes’ mean ‘Yes,’ and your ‘No’ mean ‘No.’ Anything more is from the evil one.” Those are strong words for Jesus to say but he wants people to understand that to be deceitful or to lie is never something God wants. 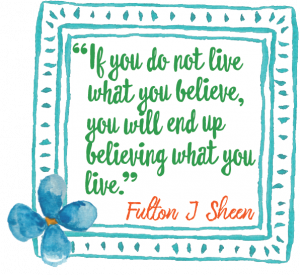 Venerable Fulton J Sheen once said, ” If you do not live what you believe, you will end up believing what you live.” Sincerity is about living in the truth and living the truth of our faith. The Catechism number of the month is all about truth. It is number #2468 of the Catechism of the Catholic Church: Truth as uprightness in human action and speech is called truthfulness, sincerity, or candor. Truth or truthfulness is the virtue which consists in showing oneself true in deeds and truthful in words, and in guarding against duplicity, dissimulation, and hypocrisy.